Madhav Ramadasan showed a glimse of the talent he got through Melvilasam, and now another flick from him “Apothecary”. Another film with a unique title but has its relevance considering the theme being associated with the medical profession. This time the focus shift from in house military court proceedings to the "Business " prevalent in the medical services where clinical testing is done on helpless victims for money. We know and have heard about this and this case is honestly shown here. The narration has a present past portrayal and show the faceoff between Dr Vijay Nambiar and his patients in a different way. Direction is top notch and the film is a classy type and is devoid of the regular commercial masala flavours and so naturally there is lagness at times as the film moves at a snail pace. But that cannot take any credits from the film that will be a discussion point in the coming days. Cinematography was good while the cuts were smooth. Still a bit of trimming was needed. Background score was haunting and touching as well suiting the various moods in the film and there is only one song that appears right at the end and it was also worth hearing. 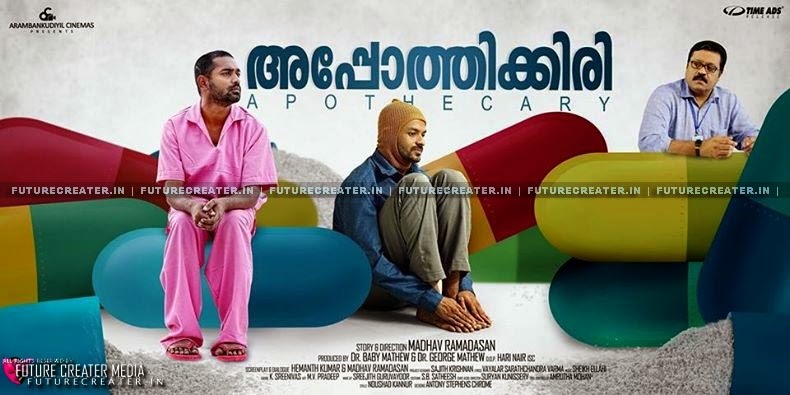 It is a touching and different experience with Apothecary, a film that is not recommended for people looking for just plain entertainment in a film. Whether it makes money at the box office or not does not matter because it surely a visual treat for the best emotional movie lovers, and for that Madhav Ramadasan worth a great appreciation. # Hope that the political issues happened today over Kozhikkode and some other releasing centers against Suresh Gopi will not affect the movie in further days. Please don't do this political parties, its not only a movie of Suresh Gopi, lots of peoples efforts are behind it. Respect each creativity and never mixup dirty politics with the art.